Love has come to mean many things. It’s used to describe emotions. It’s the glue for relationships. It frames countless stories. The greatest of these stories opens before time began and echoes throughout eternity. It’s the story of God’s unrelenting, overwhelming love for His people. The truth of love is even more majestic, more staggering and more extraordinary than we can understand: God doesn’t just love us. He is love. R.C. Sproul takes a remarkable look at this most profound truth. God’s Love delves deep into Scripture to explore this dynamic attribute of God, which finds its ultimate expression in His Son. 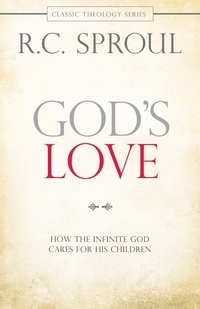 Dr. Sproul also examines the paradoxes, such as a loving God and divine hate, and how love coexists with God’s sovereignty. Practical, insightful, and revolutionary, God’s Love compels us and calls us to reflect His nature of unconditional love.